It has been a long winter, but the last of the snow is melting rapidly. In New Hampshire, we are just beginning mud season. 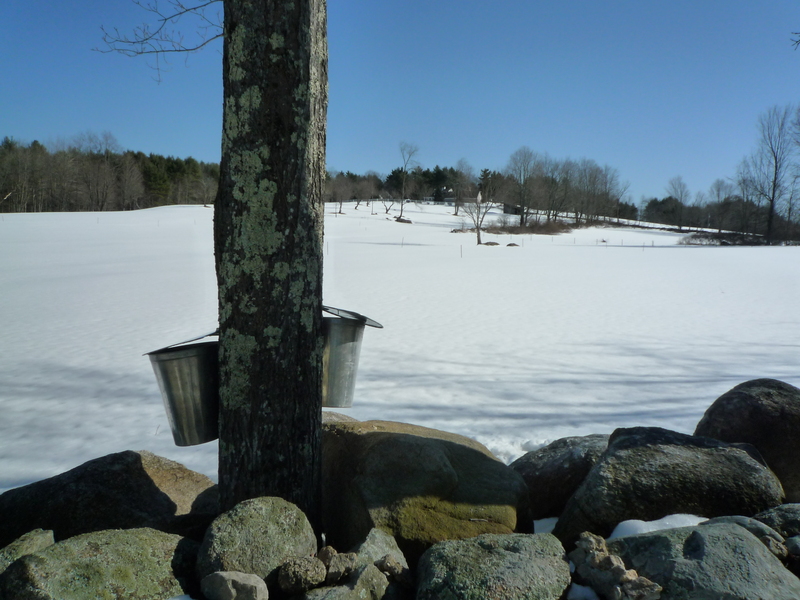 There have been other harbingers of spring, starting several weeks ago with the silver spigots and buckets of maple sugaring. One of our neighbors has been collecting sap and hauling it down to what looks like some crazy distillery in the woods, complete with a wood frame covered in tyvek, a trash barrel full of empties (miller lite) and a blaring boom box. Just about 24/7, he and his cronies have been evaporating down three giant pans of sap over a wood fire. It’s a labor of love, maple syrup, with a forty to one working ratio (sap to syrup). However, my neighbor, who has a creative approach to life in general (I speak euphemistically), has found his own way to ‘stretch’ the product. A few days ago, trying to walk off the effects of my fifth infusion, I wandered on down to the maple syrup factory. My neighbor’s cousin was manning the pans, and I asked him if the massive pot of clear liquid on the ground was virgin sap. Nope, he said—It’s olive oil. After I wondered what on earth they used olive oil for, he looked me in the eyes (I’m making that part up—he specifically did not look me in the eyes) and said “It’s hard to make that much syrup.” And then I understood. They were cutting the maple syrup with olive oil. The moral of this part of the story is: if you’re in New Hampshire and a guy named Ray asks you if you’d like to buy some maple syrup, just say no. Firmly. There’s not a damn thing I like about the first seven words, which in plain english simply mean that there is yet cancer scattered throughout both of my lungs. However, at this stage of the game, one focuses on the second half of the sentence: without significant interval change. In two weeks, I will have my second maintenance infusion of alimta, followed by another CT scan, and then a reassessment of the situation. In the meantime, I’ve finally kicked the virus and am feeling stronger again. Today I took a rake to the gardens for an hour and also went on a walk. I’m now exhausted but in the good sort of way that comes from physical exertion; I shall sleep soundly tonight. This entry was posted in Chemotherapy, Scans, Treatment and tagged lung cancer, lung cancer CT scan, maple sugaring, stage IV lung cancer. Bookmark the permalink. Have a very healthy and healing sleep tonight. I take “stable” as good news. Wow, definitely makes me want to know who makes my maple syrup!! Incredible story. Glad that virus took leave. And I’d focus on the second half of that report, too! Take care, Linnea.